You can see interesting souvenirs, which were made by artists and craftsmen from Russia. Whatever kind of folkcraft is looked at, it reflects the richness and diversity of the nation’s soul and the splendour of the works crafted by its hands. The Russian “Matrioshka”, which has come to be the national souvenir, is well known and very popular in many countries of the world. This unpretentious toy is as yet quite young: it made its first apprearance in 1900 at the World Fair in Paris. The soft wood (usually lime-tree) is turned on a lathe; the product is then “dressed” in bright sarafans and kerchiefs with a pattern of flowers. The Kokloma is first fashioned from a chunk of wood, the unpainted “whiteness” is primed, steeped in drying oil, and aluminium powder is then rubbed in by hand. An improvised decorative pattern in oil paints is then laid on with free strokes of the brush. The painted items are given several coats of a special varnish and then fired in a furnace where the high temperature turns the aluminum powder under the varnish coating into glittering “gold”. The history of Russian pottery begins with Gzel majolica of the eighteenth century, which was followed in the nineteenth century by half-faience, porcelain and thinly wrought faience. Gzel art was based on traditional artistic principles inherited from old masters. On the whole, Gzel art includes stylistic uniformity and individual variations, which helped to create various styles and diverse artistic manners developing in the frame of a common artistic system. 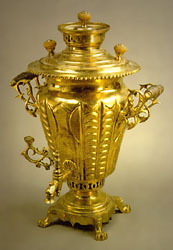 Samovars are a necessary feature of the Russian mode of life and consequently a part of Russian applied art. 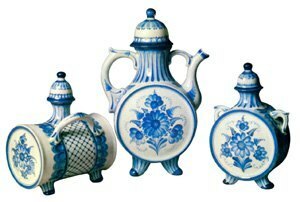 The earliest samovars resembled English tea urns or tea vessels. They had already the principal characteristic element – a tube situated inside and a wind box, but a spout and a carrying handle instead of a tap. They were made of different metals – copper, iron, silver, silver plating on copper, steel, cast iron, and their decoration testifies to different stylistic art trends echoing the general tendencies in the artistic tastes of different periods.